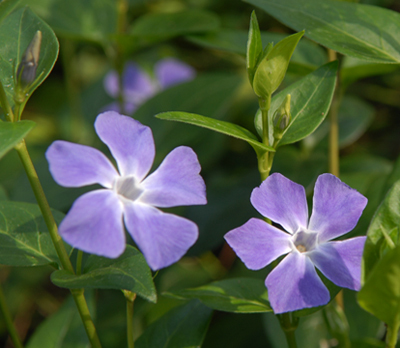 Vinca are generally better known under their common name of Periwinkle. Vinca minor ‘Blue and Gold’ has a gold edge to otherwise deep green leaves and forms a great groundcover plant. Foliage is evergreen and contrasts well with the darker violet blue flowers. Although very well suited to shade, they are perfectly happy anywhere that isn’t overly wet. 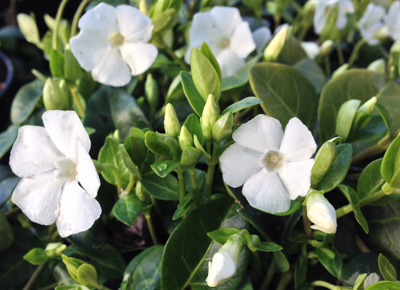 Vinca minor ‘Alba’ has glossy, dark-green foliage and brilliant, pure white flowers in spring. Excellent groundcover being hardy, quick to establish and happy in sun or shade providing it doesn’t waterlog. Trimming back with shears after the first flowering will encourage a second flush in summer. Height: 15cm. Our latest offer is for three plants of each variety (6 plants in total). Our normal price is £41.94 + delivery, but for the next couple of weeks Country Life readers can buy these for £30.00 + delivery.